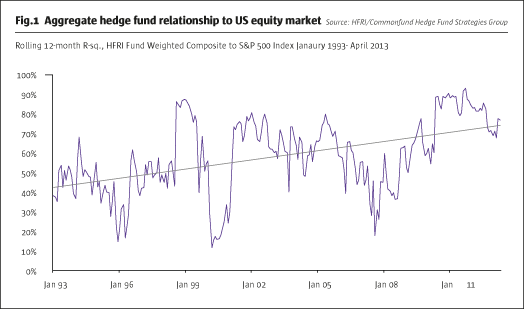 Prolonged equity bull markets can add to the challenges of hedge fund manager selection. Within the universe of several thousand active hedge funds, many managers have received outsized benefits from the extended broad market updraft, and for an allocator selecting managers to hire – and perhaps selecting among others to fire – the draw of managers that have produced outsized recent winners can be powerful. Yet such a strategy can work against investors in the long run. That is at least partly because this strategy is implicitly based on the manager’s ability to continue to track market movements across investment environments, even though evidence for this ability within the manager universe is not robust. Such a strategy also implicitly discounts alpha, which experimental evidence suggests also detracts from the best long-run results. For the large majority of hedge fund investors, frequent and repeated manager turnover is neither a practical nor desirable approach to managing a hedge fund portfolio. However, experiments simulating such an approach can be useful in that they can illustrate potential long-term consequences of different selection strategies. In this article, we present results of one such experiment that offer a strong caution against the practice of chasing winners, or hiring managers that have had the highest returns. The experiment results also suggest that alpha – in this case, return not accounted for by beta to the broad equity market, including from manager skill – consistently outperforms absolute return as a selection criterion. Amid a prolonged bull market, there may be a natural tendency for hedge fund investors to gravitate toward managers that have captured a significant share of the market’s upside; however, since such equity upside capture is statistically a relative rarity among hedge fund strategies, such a selection criterion may lead to adverse selection. Hedge funds play diverse roles in institutional portfolios. They can provide targeted scenario-specific protection, such as inflation or tail-risk hedging, act as conduits to complex or “hard-to-access” assets, or deliver exposure to uncorrelated market-neutral or data-driven strategies, among other roles. Perhaps most commonly, however, hedge fund mandates carry the broader objective of absolute return: positive return is both the goal for performance and implicitly the basis on which to evaluate individual portfolio line items over time. Consider that if “seeing the ball” were a trait that generally described top performers, persistence of returns would be a regular and characteristic feature of hedge fund track records. However, our proprietary evaluation, coupled with a substantial body of research, generally finds that while there is evidence of positive performance persistence in hedge funds, statistically such persistence is confined to short windows. Too short, that is, to form the basis of a realistic investment strategy for the large majority of allocators, most of which would prefer not (or are structurally unable) to manage a hedge fund allocation with continual short-term turnover. Cliff Asness suggests a compelling framework for performance persistence based partly on factors he describes in “Value and Momentum Everywhere”: not only is positive persistence associated with short-term windows of within a year, but performance reversals of the opposite sign are associated with longer-term windows of about three to five years. Applying this concept to hedge funds, managers that may have been cast among a losers heap for failing to see the ball – that is, for pursuing strategies with beta properties that are out of favour – might very well demonstrate a sort of mean-reversion effect, on average, and subsequently outperform. This provocative framework presents a powerful caution against return-chasing in hedge funds in particular, insofar as investors naturally place disproportionate weight on recent performance windows of about that length (three to five years) in assessing whether a manager is, indeed, seeing the ball. In other words, the windows Asness describes are precisely the types of time periods to which hedge fund investors may gravitate in identifying attractive candidate investments. Results consistent with such large-scale effects can be demonstrated in a simple experiment. 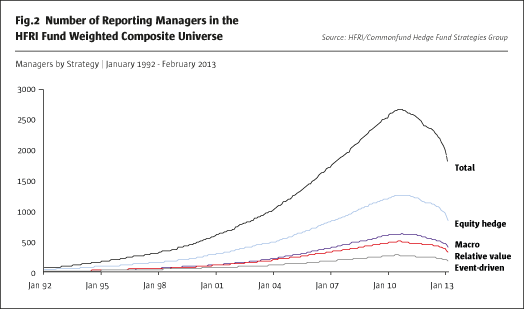 Starting with the HFRI Fund Weighted Composite universe, a broadly representative universe of approximately 3,300 actively reporting managers from all four strategy groups – equity hedge, event driven, macro, and relative value – we construct perpetual, actively managed, multi-manager portfolios based on returns from the most recent rolling evaluation period. In one iteration parameters are set to 18-month evaluation periods, so that hires are made every month out of the database based on the last year and a half of results at a rate of two hires and fires per month. 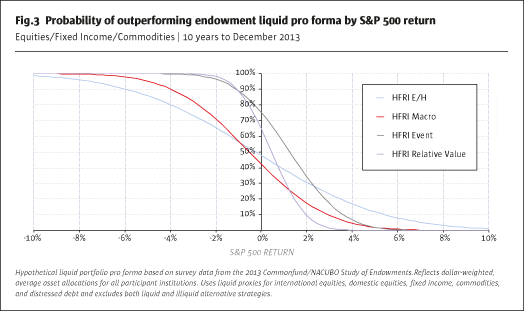 In other words, managers are added to the portfolio on the basis of the highest returns in the evaluation period, held for the subsequent 18 months, and then redeemed and returned to the candidate pool. The initial result may at first glance seem promising: portfolios comprised of recent winners (from the last 18 months) do indeed subsequently outperform the universe average, though not by a consistent margin. So far, results are aligned with a satisfyingly intuitive “seeing the ball” selection strategy. What happens if we repeat the same experiment but extend the 18-month evaluation period to longer windows of 36, 48, and 60 months? Results for the winners-chasing selection strategy start to deteriorate. In fact, as the window gets longer and extends to five years, the winners rule takes on a negative sign, meaning it underperforms the strategy of drawing at random from the candidate manager universe. These results establish some basis of comparison for evaluating a chasing winners strategy across time windows. However, they are also based on arbitrary evaluation and holding periods. Beyond impractically short windows, however, there is little evidence that absolute performance-based manager selection is a strategy worth pursuing. In fact, our findings strongly suggest the opposite: at longer windows, chasing winners tends to lead to below-average returns, whereas chasing “losers” actually demonstrates a slightly positive relative performance. Thus, not only does positive-return persistence tend not to work as a selection strategy, but it is especially ineffective in those medium to long-range horizons that institutional investors may prefer, and indistinguishable from a strategy of selecting losers. At most windows, then, simulation results confirm that return is an unreliable basis for manager evaluation. However, the experiment does not suggest that hedge fund investors find themselves armed with only a dartboard. Consider how results improve when “winners” are defined by alpha instead of absolute return. In nearly all time windows, portfolios comprised of top alpha-based performers outperform return-based portfolios out of sample (i.e., in periods not included in the experiment). Importantly, the relative result for alpha also holds for evaluation lengths of the otherwise treacherous three to five-year window, so that selecting managers based on alpha – even single-factor alpha to the MSCI World Index – generates a significant improvement relative to winners. In all periods, alpha-based selection effectively offsets much of the adverse effects of return-chasing. Thus, while a certain form of skill may very well be evident in managers that have produced positive returns in the recent past, there is evidence of a statistical benefit of pursuing managers that have produced alpha: the selection strategy outperforms mean hedge fund universe returns in nearly every window, and wards off some of the most pernicious effects of those windows that leave absolute return chasers most vulnerable. Finally, there is a reason why a chasing winners strategy may have a particular appeal now, as an equity bull market turns several years old. However, it is important to recognize that choosing from those managers that have tracked or kept up with an equity bull market is, in a sense, vulnerable to a “seeing the ball” fallacy, and can be a form of adverse selection in that it selects from a narrow subset of hedge funds. Consider that in a probabilistic sense, tracking or beating rallying markets is not what most hedge funds are ideally suited for. To illustrate, Fig.3 demonstrates, for each of four hedge fund strategy indices, the probability of outperforming a hypothetical liquid institutional portfolio, by monthly return of the S&P 500. In other words, as the equity market rallies, how likely is it that the macro index (or equity hedge, event, or relative value) will outperform the broad portfolio? The probability is not veryhigh, and for outsized positive market returns, it becomes remote, illustrating on a comparative basis that downside protection is more aligned with most hedge funds’ return profile. In that sense, while attractive alpha producers can certainly emerge in bull markets, they also compete for investor attention with many that are beta-driven, creating conditions for a potential adverse selection problem: narrowing a selection to a subset of managers that have delivered outsized returns along with the market may strongly colour hire/fire decisions. Thus, the lesson from the simulation experiments is to be cautious: alpha works better. *In the hypothetical hire/fire experiment, the MSCI World acts as a single beta factor. In a manager selection context, that is almost certainly too simplistic a model. It is, nevertheless, a significant improvement even in simple form. Although hiring top-performing hedge funds appears to be an effective portfolio strategy within certain short time windows, it is typically ineffective in the longer windows which allocators generally use to evaluate managers. In fact, in most such longer evaluation windows, “loser” portfolios outperform winners. Within our experiment, selection strategies based on alpha – even single-factor alpha to the broad equity market – offset the negative “chasing winners” effect to a significant degree, and generally outperform random selection. It may benefit hedge fund investors (who base hire and fire decisions on whether managers have captured a significant portion of the equity market’s upside) to be particularly diligent about identifying beta-driven returns as an equity bull market turns several years old. Commonfund Hedge Fund Strategies Group is a division of Commonfund Asset Management Company, Inc., a wholly owned subsidiary of Commonfund. Since an initial hedge fund investment in 1982, Commonfund has played a fiduciary role in selecting hedge fund investments for clients. They employ an institutional investment management philosophy and process in a fiduciary framework to help clients with hedge fund allocations through the creation of innovative multi-manager funds and customized separate accounts.